Jefferson Fiberglass designs, builds, and repairs custom fiberglass products for both commercial and household purposes. 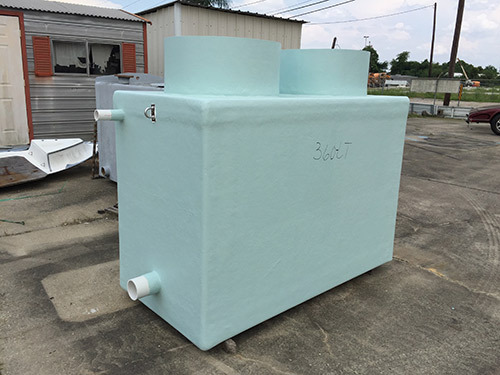 Some of our custom fiberglass products include battery boxes, cabinets, enclosures, grease traps, oil interceptors, fish transport tanks, ice boxes, drip and spill containment trays, and fiberglass washers, isolators, and plates. We also have a first-class repair division that can restore almost any fiberglass products like boats, swimming pools, or truck and bus hoods. We are your one-stop shop for reliable, high-quality fiberglass solutions across all industries. Our experts work with you from start to finish to create a long-lasting product that suits your needs and your budget. 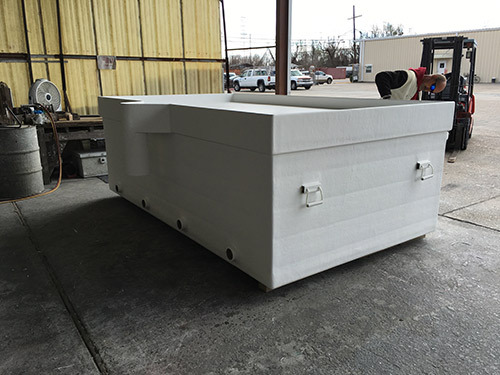 Our custom-made fiberglass enclosures meet the storage demands of several industries, including marine, chemical, electrical, oil and gas, and solar applications, just to name a few. 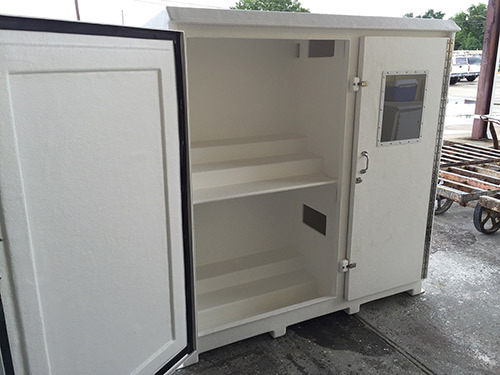 Let us design a rugged cabinet to safeguard tools and safety equipment at the shop, or we can create a portable cooler to address the specific needs of your food truck. Our enclosures are custom-made in any shape or size with an assortment of features. Food and car washing establishments throughout the Gulf Coast rely on well-built grease traps and oil interceptors to keep the water supply clean and to comply with local regulations. Our fiberglass traps and interceptors are non-corrosive and rust-proof, have design flexibility, and are lightweight for easy installation and transportation. We offer above-ground and in-ground units in various sizes, along with durable covers to protect your underground traps from traffic. Custom fiberglass products serve many functions in the food and hospitality industries, and they’re just as useful around the house. 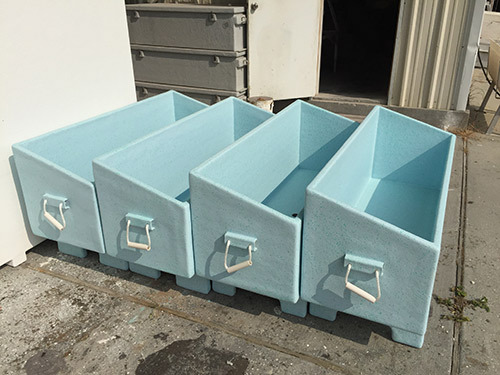 We manufacture non-drip insulated sinks, cold storage units, and drink bins for restaurants, bars, hotels, and households, as well as durable table extenders, portable and stationary ice boxes, and functional fish cleaning stations. Minimize cleanup and prevent contamination, regardless of the application, with our custom-designed drip and spill containment trays. 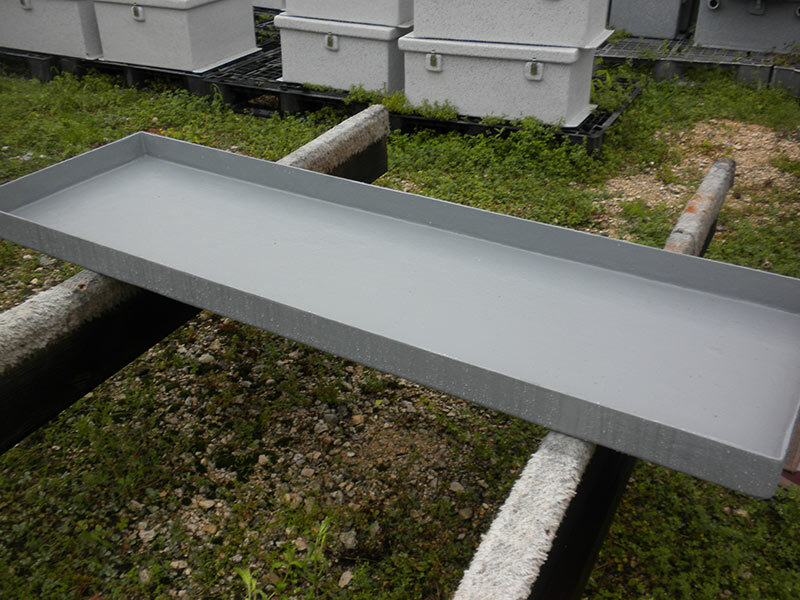 Chemical plants, laboratories, and warehouses that work around hazardous materials are just some of the places that could benefit from fiberglass drip, spill, or containment trays because of their non-corrosive and lightweight properties. From fishing industry applications to marine science tasks, our fish transport tanks are built to meet the diverse demands of storing, moving, and hauling live fish. Choose from single or multiple compartments, add convenient slide gates, and install on-board oxygenation systems to suit your specific needs. We also design tanks with overflow protection, electrical wiring, and multiple drains to fit your purposes. 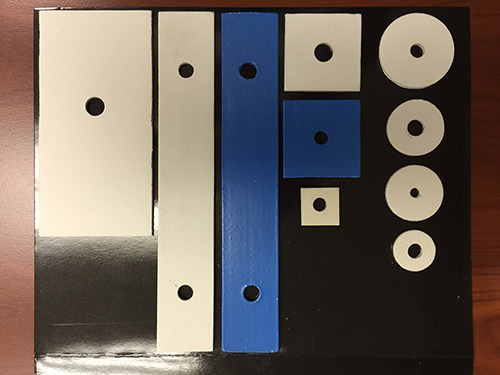 Jefferson Fiberglass produces custom washers, plates, and isolators in any shape or size needed for a wide range of offshore, chemical plant, electrical, and manufacturing applications. We recommend fiberglass, as opposed to metal, for these parts because it is durable, non-corrosive, rust-proof, and it is not affected by heat, chemicals, or electric currents. Our expert repair technicians can return almost any fiberglass product to like-new condition, including boats, recreational vehicles, bathtubs, slides, and swimming pools. 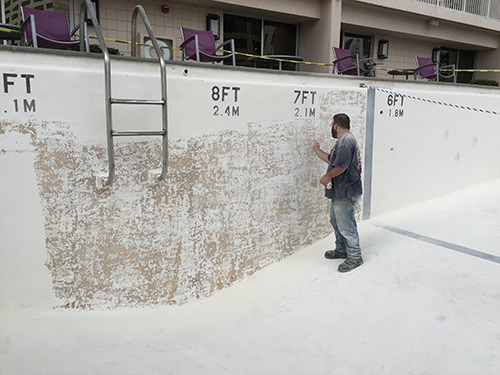 Trust us to handle your commercial fiberglass repairs as well. We also repair utility buckets and booms, marine valves, hatch covers, truck and school bus hoods, bumpers, and much more. We welcome your custom fiberglass requests, and we enjoy creating unique products to meet the specific needs of our customers. 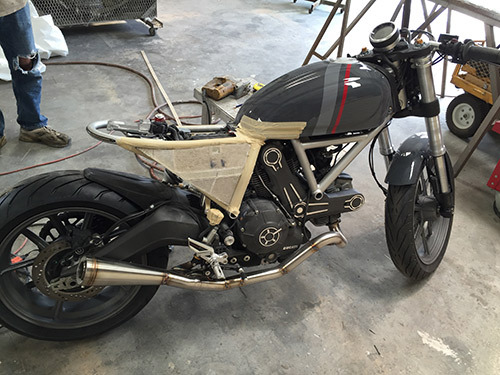 Our custom projects include fiberglass covers for motorcycle gas tanks and components, durable outdoor planter boxes, truck bed liners, and rugged accessory boxes for trucks and trailers. Give us a call to discuss your requirements. Jefferson Fiberglass is also the region’s premier source for marine windows and raw fiberglass materials, including mats, resin, bubble rollers, wax, plywood, and webbing solution. Contact us online, by phone, or in person to find your ideal fiberglass solutions.